It’s 18:06 on Friday 20 June 2006 and 66,000 people, mostly clad in Germany colours, have packed into Munich’s shiny new Allianz Arena on a warm evening to watch the first match of the World Cup. The crowd is bouncing, buoyed by the home team’s tenacious start and still drawing breath following a 30-yard shot from Thorsten Frings that narrowly missed the net. Noise levels begin to swell again as Philipp Lahm picks up a loose ball wide on the left. He is faced with two Costa Rica defenders. Bastian Schweinsteiger is offering the overlap, but Lahm drops his right shoulder and shifts the ball inside quickly with his right foot, leaving Danny Fonseca on his backside. The Costa Rica player lands heavily and, as he glances over his shoulder, the next thing he sees is Lahm opening up his body and winding back his right foot. Lahm blasts the ball past everyone in the area and into the top right corner, the ball kissing the post on its way in. Six minutes in, and the first chapter of Germany’s Sommermärchen has been written. Lahm was an instrumental and respected footballer but, even in that moment, as he scored the opening goal at a World Cup in his home city, few of the millions watching would have predicted just how important he would become for his club and country over the next decade. Born in Munich 33 years ago, Lahm began his long career with Bayern when he joined the youth team in 1995 from local club FT Gern München. Having started life as a forward, Lahm soon found his home as a full-back, mostly operating on the left. Despite being an obvious talent, his path into Bayern’s first team was blocked by two formidable French defenders, Bixente Lizarazu and Willy Sagnol. So the one-club man began his career on loan at another club, a short hop from Bavaria to Baden-Württemberg. Hermann Gerland, now Carlo Ancelotti’s right-hand man, was then in charge of the Bayern reserves and felt Lahm was too good to play with his team in the third division, so he recommended him to VfB Stuttgart manager Felix Magath, who duly organised a two-year loan deal. 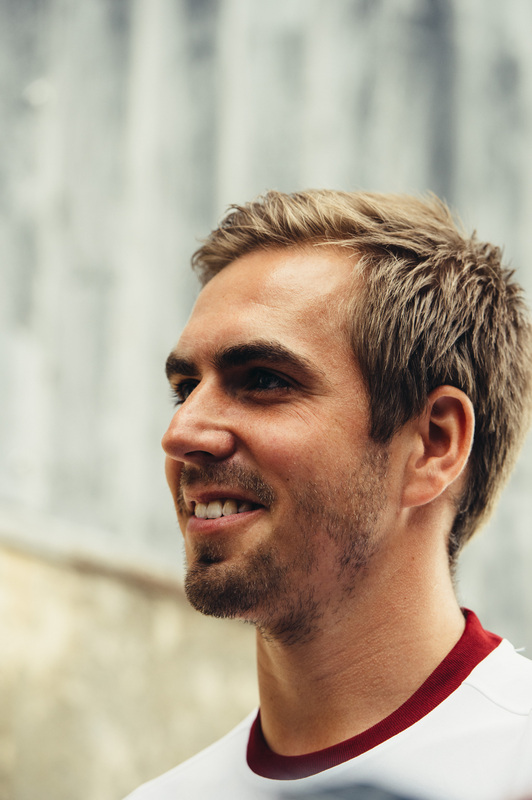 After making his Bundesliga debut on the opening day of the 2003-04 season, Lahm soon became Stuttgart’s first-choice left-back. Aside from a couple of injuries, his time in Stuttgart was a success. He returned to Munich having made 53 appearances in the Bundesliga and picked up some Champions League experience. Loan moves do not always work out, but Lahm’s stint on the banks of the river Neckar paid dividends for all parties involved, not least Bayern, who suddenly had a new full-back, and a German international to boot. Lahm’s form in Stuttgart had catapulted him into the senior Germany squad, where he soon claimed ownership of the left-back slot. He had won 15 caps for his country before his Bayern Munich career had properly begun. It would have been more but for an injury sustained towards the end of his loan spell, which not only temporarily curtailed his international progression but also delayed his long-awaited Bundesliga debut for his parent club. Eventually, Lahm took to the pitch for Bayern in November 2005 and established himself as the club’s left-back, ushering Lizarazu into retirement. As with the majority of players of Lahm’s generation, winning the World Cup in Brazil has to be seen as the pinnacle, but it was the 2006 tournament on home soil that elevated Germany back on to the world stage after their dour showing at Euro 2004, where they were knocked out at the group stage without winning a game. And it was at this hotly anticipated and feverishly supported tournament that this unassuming and unspectacular player made perhaps his most famous contribution. His opening goal lit up an emotional summer that brought back some national pride and touched German society well beyond the confines of football. Players and fans alike had been whipped into a feelgood frenzy by the World Cup and Lahm returned to what would become a decade of near omnipresence in the Bayern team. Although Bayern finished an almost unimaginable fourth in the Bundesliga in the 2006-07 season, they have gone on to dominate, winning the title in seven of the last 10 years. In Europe, however, success has not always been forthcoming. Lahm only tasted the glory of winning the Champions League after he had lost two finals: against José Mourinho’s impenetrable Inter side in 2010 and then the infinitely more bitter defeat against Chelsea in the ill-fated “finale dahoam” in Munich two years later. Lahm and Bayern bounced back from those heartaches in spectacular fashion. Now the captain of both club and country, he shouldered more responsibility and also developed as a player. By the start of the 2012-13 season, which would be his most decorated, he had clocked up just as many appearances on the right side of defence. Lahm had entered the second phase of his career as a roving right-back, almost a deep-lying right-sided playmaker, charged with more than simply overlapping and whipping in crosses. He was an ideal foil for Arjen Robben, with whom he formed a deadly duo on that flank. Robben’s now infamous left-foot inswingers win games and grab headlines, but more often than not Lahm’s pass or movement off the ball enabled the Dutchman to gain the extra half-yard required to make the incisive move infield. Lahm also chipped in with 11 assists in the 2012-13 season, becoming the first defender in the league’s history to hit double figures. His relationship with Robben was just one component in a season when everything came together and culminated in Beryn winning a glorious, record-breaking treble under Jupp Heynckes. Both Heynckes and Lahm had the good fortune of being part of a very special group, with players such as Bastian Schweinsteiger, Franck Ribéry, Thomas Müller, Jérôme Boateng, Manuel Neuer and Toni Kroos hitting top form alongside emerging talents such as David Alaba and Xherdan Shaqiri. Lahm played the entire treble-winning season at right-back, but things were about to change. Fresh from a year-long sabbatical, Pep Guardiola arrived in Munich in 2013 with big ideas and even bigger expectations. He walked into a dressing room of Champions League-winners with the aim of changing things for the better. The degree to which Guardiola was a success is a popular debate, but one specific tactical tweak certainly bore fruit. Bayern’s clash with Chelsea in the Uefa Super Cup early in his first season pitted him against Mourinho. Half an hour into the game, Bayern were losing 1-0 and being suffocated by Chelsea. Guardiola was looking for a way out. In his book Pep Confidential, Martí Perarnau reports that it was Guardiola’s assistant, Domenec Torrent, who suggested moving Lahm from right-back into a defensive midfield role, mid-game, to wrestle back control of the ball. This was not the first time Lahm had played in midfield. In an uninspiring friendly against England in 2007, Lahm had appeared as a No6 in a starting XI bereft of many of the previous summer’s heroes. Guardiola had seen enough of Lahm in training to know he was wasted as a full-back and could be more than a destroyer in midfield. In Lahm, Guardiola saw someone capable of anticipating passes, protecting the ball and instigating attacks. The game turned in Bayern’s favour and Guardiola suddenly had a new crux of his team, a new pivot. Guardiola has since called Lahm the most intelligent player he has coached. His latest metamorphosis was another blurring of the lines between defence and midfield. It made him the perfect player to adopt Guardiola’s intricate tactical plans, allowing other players such as David Alaba, Xabi Alonso and Rafinha to rotate and float between positions. Lahm is a master of receiving the ball and taking it forward in the same movement, his body often deliberately leaning forward. He glides over the field, not just shuttling up and down the right flank, but also drifting deliberately infield, penetrating crowded midfields from a deep right position. And, as his responsibilities were increasingly found in the centre of the pitch, he often took on the role of problem-solver and pacesetter. Lahm’s ability to adopt ideas of what an inverted full-back should be may even have given Guardiola problems in his first season in Manchester; as good and experienced as Pablo Zabaleta, Bacary Sagna and Gaël Clichy may be, they are not Lahm. Lahm may look like every mother-in-law’s dream, but he can rock the boat if he deems it necessary. Unlike other quiet and unassuming stars who keep their opinions to themselves before becoming critical and controversial once they have hung up their boots, Lahm’s most infamous comments came slap bang in the middle of his career, aged 27. In an interview with the Süddeutsche Zeitung in 2009, Lahm accused the Bayern board of working without a defined plan and buying players without a clear philosophy of how to fit them into a tactical system. His comments were not the act of a disgruntled star throwing his toys out of the pram, but someone totally ingrained in the club giving an honest and considered opinion. Having been raised at a club marked by the footprints of vocal, alpha male leaders such as Steffen Effenberg, Oliver Kahn and Michael Ballack, Lahm has been partly responsible for ushering in a different kind of leadership for his club and country, one characterised less by outward aggression and displays of passion, and more by quiet pragmatism, calculation – and no less inspirational. Manuel Neuer is favourite to succeed him as captain and, although the extra responsibility will not weigh down his broad shoulders, filling the void on the pitch may be a different matter. Hopes will undoubtedly be pinned on Joshua Kimmich, but the youngster has had limited opportunities under Ancelotti thus far and the reality is that Bayern may have to recruit two players to compensate for Lahm’s departure. Not only are the club waving goodbye to one of Europe’s best full-backs over the last decade or so, but also an outstanding midfielder with a head full of tactical nous and experience. It is one thing to perform consistently for over a decade at an elite club where mediocrity is not tolerated, but it is something else to have the ability and willingness to continually adapt and evolve your position. Lahm could easily extend his career at a number of elite clubs abroad. Who wouldn’t take a punt on someone with his pedigree, consistency and flexibility? But he has no desire to extend his playing career or boost his bank balance. Lahm has a knack of going out at the top, having packed in international football the day after he lifted the World Cup into the night sky in Rio de Janeiro in 2014. Interestingly, one thing Lahm said during that controversial interview with the Süddeutsche Zeitung in 2009 was that Bayern needed a new type of midfielder – one defenders could look for as a point of reference, an escape route in the centre of the park. He gave prominent examples of players who love possession, such as Andrés Iniesta and Xavi. He was criticised at the time but he turned into the very player he had described. In his final press conference as a Bayern player this week, Lahm said: “I just hope that the fans will remember me as a good footballer.” He did that and then some. After winning eight Bundesliga titles, six German cups, a Champions League and the World Cup, Lahm will lead out Bayern Munich at the Allianz Arena for the last time on Saturday afternoon. The chances are he won’t find the top corner like he did 11 years ago against Costa Rica, but you can guarantee the stadium will be rocking just as it did back in 2006.